What does a corneal ulcer look like? What are the causes of a corneal ulcer? What are risk factors for corneal ulcers? What are corneal ulcer symptoms? What are corneal ulcer signs? How does a health care professional diagnose a corneal ulcer? What are corneal ulcer treatment options? What types of doctors treat corneal ulcers? What is the healing time for a corneal ulcer? What is the prognosis of a corneal ulcer? Is it possible to prevent corneal ulcers? A corneal ulcer is an open sore of the cornea. There are a wide variety of causes of corneal ulcers, including infection, physical and chemical trauma, corneal drying and exposure, and contact lens overwear and misuse. Corneal ulcers are a serious problem and may result in loss of vision or blindness. Most corneal ulcers are preventable. With appropriate and timely treatment, the majority of corneal ulcers will improve with minimal adverse effect on vision. A corneal ulcer is an open sore or epithelial defect with underlying inflammation of the cornea, the clear structure in the front of the eye. The cornea overlies the iris, which is the colored part of the eye and is separated from the iris by the aqueous fluid in the anterior chamber of the eye. A corneal ulcer will often appear as a gray to white opaque or translucent area on the normally clear and transparent cornea. Some corneal ulcers may be too small to see without adequate magnification and illumination. See the first reference for pictures of a corneal ulcer. Self-treatment consists of removing contact lenses, applying a cool compress to the affected eye, washing hands often, and OTC pain medications such as Tylenol or Motrin. Most corneal ulcers are caused by infections. Bacterial infections cause corneal ulcers and are common in contact lens wearers. Bacteria can directly invade the cornea if the corneal surface has been disrupted. Some bacteria produce toxins that can cause ulceration of the cornea. This is seen in peripheral ulcerative keratitis due to the staphylococcal bacteria. Viruses that may cause corneal ulcers include the herpes simplex virus (the virus that causes cold sores) and the Varicella virus (the virus that causes both chickenpox and shingles) if it involves the upper eyelid and tip of nose (herpes zoster ophthalmicus). Although these viral illnesses usually cause only herpes simplex or herpes zoster keratitis or keratoconjunctivitis, corneal ulcers can develop. Fungal infections can cause corneal ulcers and may occur with improper care of contact lenses or overuse of eyedrops that contain steroids. Parasites like Acanthamoeba may also cause corneal ulcers. Tiny cuts or scratches in the corneal surface may become infected and lead to corneal ulcers. For example, metal, wood, glass, or almost any type of particle that strikes the cornea can cause minor trauma. Such injuries damage the corneal surface and make it easier for bacteria to invade and cause a corneal ulcer. A corneal abrasion is a larger loss of the corneal surface and may ulcerate if left untreated. Disorders that cause dry eyes (keratitis sicca) can leave the eye without the germ-fighting protection of the tear film and cause or aggravate corneal ulcers. Disorders that affect the eyelid and prevent the eye from closing completely, such as Bell's palsy, can dry the cornea and make it more vulnerable to ulcers. In addition, mechanical problems of the lid turning inward toward the eye or lashes growing inward and rubbing against the cornea can cause corneal ulcers. Any condition that results in a loss of sensation of the corneal surface may increase the risk of corneal ulceration. Chemical burns or other caustic (damaging) solutions splashing into the eye can injure the cornea and lead to corneal ulceration. People who wear contact lenses are at an increased risk of corneal ulcers. The risk of corneal ulcers and other complications are lowest with daily wear disposable lenses. The risk of corneal ulceration increases at least tenfold when using extended-wear lenses. Extended-wear contact lenses are those contact lenses that are worn for several days without removing them at night. Scratches on the edge of the contact lens can scrape the cornea's surface and make it more open to bacterial infections. Similarly, tiny particles of dirt trapped underneath the contact lens can scratch the cornea. Bacteria may be on the improperly cleaned contact lens and get trapped on the undersurface of the lens. If lenses are left in eyes for long periods of time, bacteria can multiply and cause damage to the cornea. Wearing contact lenses for extended periods of time can also block oxygen to the cornea, making it more susceptible to infections. Improper care of contact lenses also increases the risk of corneal ulcer. In addition, some patients with immunological disorders (immunosuppressed, rheumatoid arthritis, lupus, and others) may develop corneal ulcers as a complication of their disease. Patients with immune-mediated scleritis can also develop corneal ulcers. Mooren's corneal ulcer is a painful, recurrent, usually unilateral ulcerative keratitis that begins peripherally and progresses circumferentially and sometimes centrally. It is likely due to an eye-specific immune mechanism. It can frequently lead to corneal thinning and perforation, which must be treated surgically. Patients with Mooren's ulcer should be evaluated for a generalized autoimmune disorder. Risk factors for the development of corneal ulcer include having had a prior corneal ulcer, failing to wear eye protection when using power tools or during welding, eye injury, having extremely dry eyes, misusing contact lenses, failing to treat a red eye (conjunctivitis), exposure to UV light (for example, snow blindness), abnormalities of the eyelids or lashes, and suppression of the immune system. A corneal ulcer may cause pain, a feeling of a foreign body in the eye; tearing and pus or thick discharge draining from the eye may occur. If the ulcer is more centrally located in the cornea, vision might be blurry. There may be an increase in pain when the person looks at bright lights (photophobia). An ophthalmologist (a medical doctor who specializes in medical and surgical treatment of eye diseases) may notice signs of inflammation (redness) in the conjunctiva of the eye and in the anterior chamber of the eye. The redness is due to dilation of the conjunctival blood vessels. The eyelids may be swollen, and a white or gray round spot on the cornea could be visible with the naked eye if the ulcer is large. Not all gray spots are ulcers. The ulcer may be central in the cornea or marginal, at the outer edge of the cornea. There may be swelling (edema) of the cornea around the ulcer. There may be scarring from prior corneal ulcers. There may be a single (or multiple ulcers) in the eye, and ulcers may be present in one or both eyes. Some more severe corneal ulcers are associated with iritis, which is an inflammatory response within the anterior chamber. If there is severe iritis, layering of inflammatory cells in the lower part of the anterior chamber (hypopyon) may occur. In rare cases, the cornea may thin with ballooning out of the inner layers of the cornea. The presence of a corneal ulcer can be diagnosed by an ophthalmologist (and other medical caregivers) through an eye examination. The ophthalmologist will be able to detect an ulcer by using a special eye microscope known as a slit lamp. A drop containing the dye fluorescein, when placed in the eye, can make the ulcer easier to see. Scrapings of the ulcer may be sent to the laboratory for identification of bacteria, fungi, or viruses. Certain bacteria, such as a species of Pseudomonas, may cause a corneal ulcer which is rapidly progressive. Treatment aims to eradicate the cause of the ulcer. Physicians will use anti-infective agents directed at the inciting microbial agent in cases of corneal ulcer due to infection. Generally, these will be in the form of eyedrops or ointments that the patient will place in the eye. Occasionally, especially in certain viral infections, doctors will also prescribe oral medications. In certain situations, medical professionals will prescribe corticosteroid eyedrops, but people should only use them after examination by an eye doctor or other physician using a slit lamp, because in some situations, steroids may hinder healing or aggravate the infection. Physicians may occasionally utilize subconjunctival injection of antibiotics. In cases of patients aggravated by eye dryness or corneal exposure (for example, corneal exposure to a dry and/or sandy environment), tear substitutes will be used, possibly accompanied by patching or a bandage contact lens. 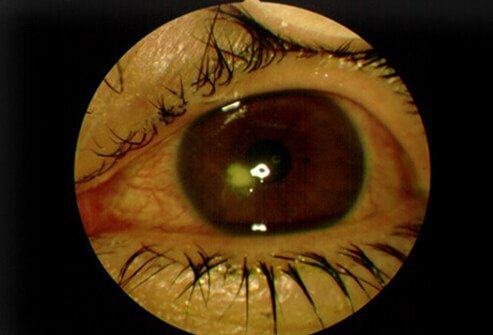 In corneal ulcers involving injury, the inciting agent must be removed from the eye (using copious irrigation for chemicals or by using a slit lamp microscope to remove particles such as wood or metal) and then adding medications to prevent infection and minimize scarring of the cornea. If the corneal ulcer is due to an eyelash growing inward, the offending lash should be removed, together with its root. If it grows back in an abnormal manner, the root may have to be destroyed using a low-voltage electrical current. If the corneal ulcer is secondary to the eyelid turning inward, surgery directed at correctly repositioning the eyelid may be necessary. Contact lenses should be discontinued in the affected eye of any case of corneal ulcer, regardless of whether the ulcer was initially caused by the contact lens. If the ulcer cannot be controlled with medications, it may be necessary to surgically debride the ulcer. If the ulcer causes significant corneal thinning and threatens to perforate the cornea, a surgical procedure known as a corneal transplant (keratoplasty) may be necessary. Individuals with corneal ulcers due to immunological diseases require patient-specific treatment with immunosuppressive drugs. Such patients may require the ophthalmologist to coordinate in conjunction with other doctors. In patients with secondary iritis associated with a corneal ulcer, cycloplegic eyedrops may be used to decrease pain and dilate the pupil. Anyone with an irritated eye that does not improve quickly after removing a contact lens or after mild irrigation should contact an ophthalmologist immediately. Do not borrow someone else's eyedrops. If you develop a corneal ulcer, you should be examined promptly by an ophthalmologist. An ophthalmologist is a medical doctor who is specialized in diagnosis and medical/surgical treatment of eye diseases. If the corneal ulcer is very serious or vision-threatening, your ophthalmologist may refer you to an ophthalmologist who subspecializes in diseases of the cornea. The time until healing depends on the cause of the ulcer and its size, location, and depth. Most appropriately treated corneal ulcers should improve within two to three weeks. Treatment may continue for longer to reduce the amount of potential scarring. Corneal ulceration is a serious condition, and with inadequate or no treatment, loss of vision and blindness may occur. The prognosis for a corneal ulcer depends on its cause, its size and location, and how rapidly it is treated together with the response to treatment. Although most corneal ulcers will cause some degree of scarring, the scar will often not cause any visual loss. If the ulcer is deep, dense, and central, scarring will cause some permanent changes in vision. Preventing a corneal ulcer is important. Individuals should wear eye protection when using power tools or when they may be exposed to small particles that can enter the eye, like particles from a grinding wheel or a weed whacker. Individuals who have dry eyes or whose eyelids do not close completely should use artificial teardrops to keep the eyes lubricated. If an eye is red and irritated and worsens or does not respond to over-the-counter eyedrops within a day, contact an ophthalmologist promptly. People wearing contact lenses should be extremely careful about the way they clean and wear those lenses. Corneal ulcers secondary to contact lenses are preventable. Always wash your hands before handling the lenses. Never use saliva to lubricate contact lenses because the mouth contains bacteria that can harm the cornea. Remove lenses from the eyes every evening and carefully clean them. Never use tap water to clean the lenses. Never sleep with contact lenses not designed for overnight wear in the eyes. Store the lenses in disinfecting solutions overnight. Remove lenses whenever the eyes are irritated and leave them out until there is no longer any irritation or redness. Regularly clean the contact lens case. Carefully read the instructions about contact lens care supplied by the lens maker. Consider using daily disposable lenses. Foster, C. Stephen. "Corneal Ulcer Stained With Fluorescein." eMedicine.com. <http://img.medscape.com/pi/emed/ckb/emergency_medicine/756148-780913-783223-1789892.jpg>. Mills, T. "Corneal ulceration and ulcerative keratitis in emergency medicine clinical presentation." Medscape.com. Nov. 30, 2015. <http://emedicine.medscape.com/article/798100-clinical#b5>. Murillo-Lopez, Fernando. "Ulcer, Corneal." Jan. 28, 2010. <http://emedicine.medscape.com/article/1195680-overview>. Poggio, E.C., R.J. Glynn, and O.D. Schein. "The Incidence of Ulcerative Keratitis Among Users of Daily-Wear and Extended-Wear Soft Contact Lenses." N Engl J Med 321.12 Sept. 21, 1989: 779-783. What were the symptoms associated with your corneal ulcer? What caused your corneal ulcer? Please discuss the treatment or medication you received for your corneal ulcer. Bell's palsy is one type of facial nerve paralysis. The 7th cranial nerve controls the muscles of the face, and although scientists do not know the exact cause of Bell's palsy, they think it may be due to nerve damage from an infection, for example, the flu, common cold viruses, and more serious infections like meningitis. The symptoms of Bell's palsy vary from person to person, but can include mild weakness to total paralysis, dry eye, dry mouth, eyelid drooping, drooling, mouth drooping, dry mouth, changes in taste, and excessive tearing in one eye. People with Bell's palsy usually don't need medical treatment, however, drugs like steroids, for example, prednisone seem to be effective in reducing swelling and inflammation are used when medical is necessary. Most people with Bell's palsy begin to recover within two weeks after the initial onset of symptoms. Full recovery may take three to six months. Tetracaine (ophthalmic drops) is prescribed as a local anesthetic prior to eye procedures such as gonioscopy, tonometry, and other eye procedures. Side effects, drug interactions, dosage, storage, and pregnancy safety information should be reviewed prior to using this medication.